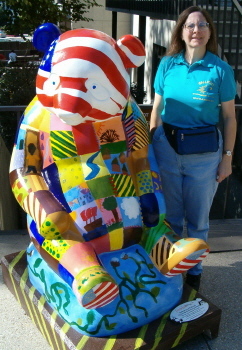 This is the other panda in the exhibition that was designed around a patchwork quilt theme. The 'Underground Railroad' was a means for escaped slaves in the pre-Civil War south to make their way north to freedom, sometimes as far north as Canada. Patchwork quilts were often used as a means to show where a clandestine stopover was located. 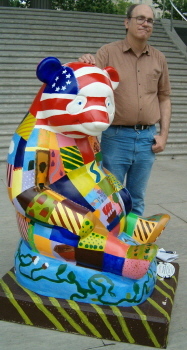 This panda was sponsored by the Embassy of Canada, and was located in front of the Embassy during the exhibition.